1. Start by setting up your breading station. In dish 1, place the pounded out pieces of chicken, set aside. Dish 2, add the flour with 1 tsp. salt and 1 tsp. pepper. Dish 3, add 2 eggs, whisked with 2 tablespoons of hot sauce. And dish 4, seasoned breadcrumbs. 2. 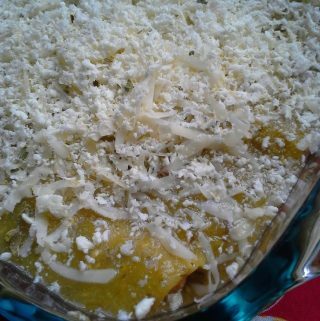 One at a time, dip chicken in the flour,then egg, then bread crumbs. 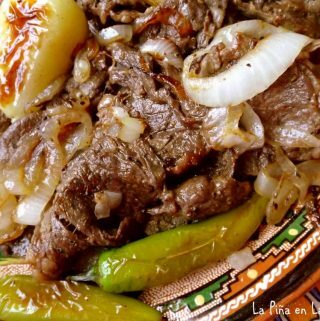 Transfer to a plate and let sit for 20 minutes. 3. After a little while, peheat oil for 5 -6 minutes in a skillet at medium heat. While that oil is heating, preheat oven to 250 degrees and prepare a cookie sheet, topped with a metal rack. 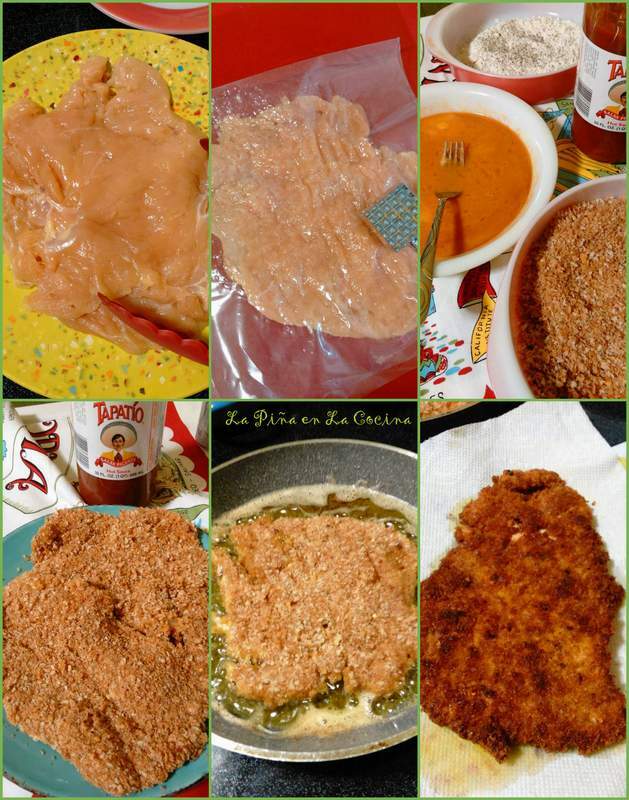 When ready, carefully lay milanesa into hot oil. Cook for 3 minutes per side or until golden brown. Transfer the chicken onto plate lined with paper towels to absorb some of the oil. Then transfer metal rack lined with baking sheet and keep warm in the oven. Repeat until all chicken is cooked. 4. 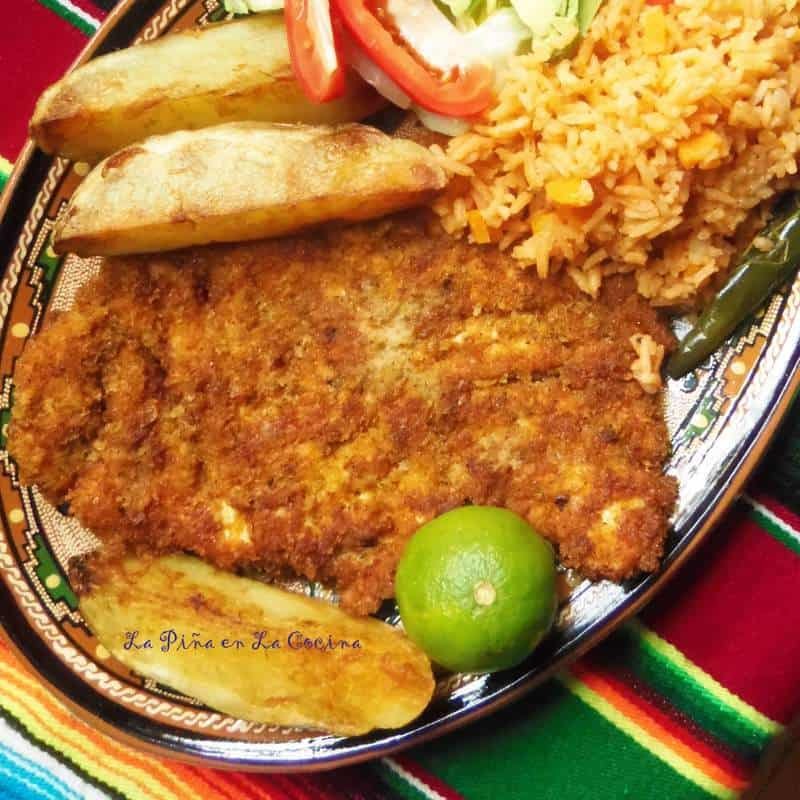 Serve as is with rice, beans, salad, salsa and warm tortillas for making tacos…or you can change it up and top a fresh salad with the sliced chicken milanesa. Yields 4 servings. 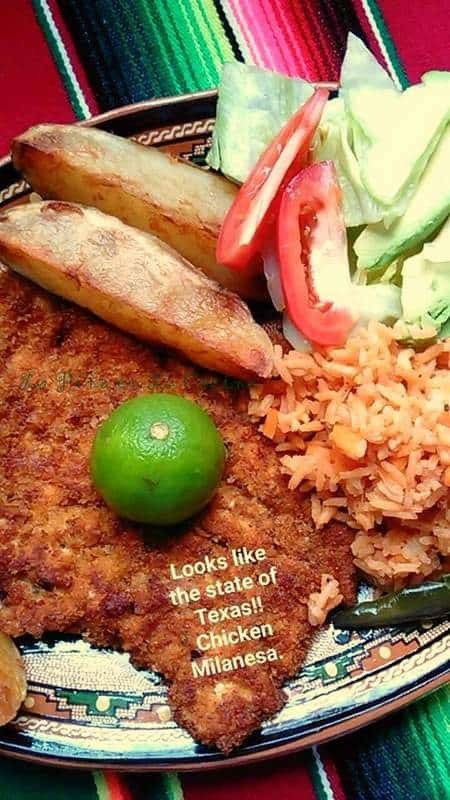 Tips~ A variety of seasoned breadcrumbs for milanesa can be found at a well stocked Mexican markets or carniceria(meat market). Another popular and commonly used coating is saltine crackers instead of bread. 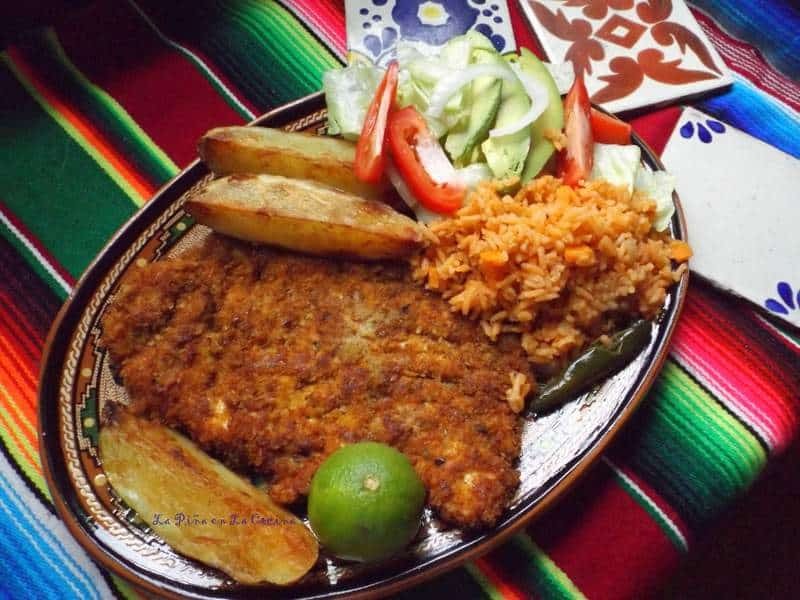 Tips~An easy and traditional side for Milanesa are fried potatoes. My Mom would typically prepare potato wedges. 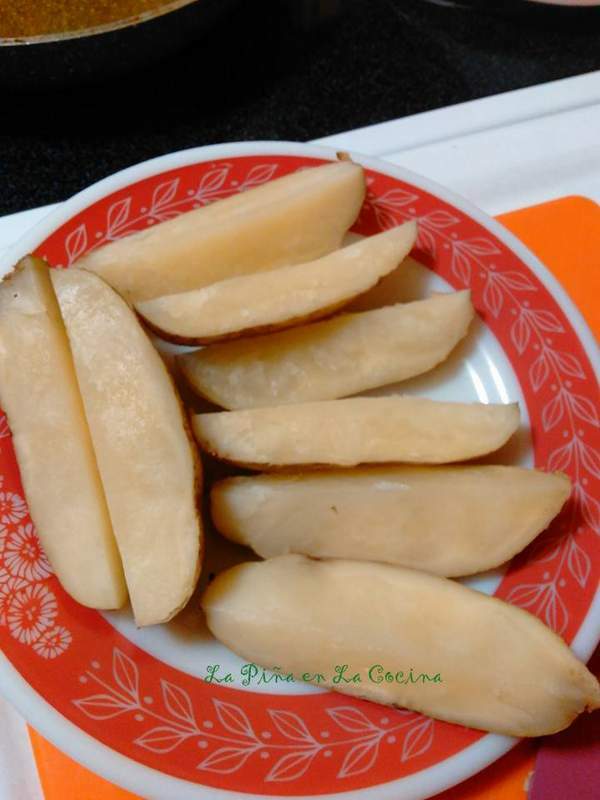 After washing potatoes, I cook them on high in the microwave for about 2 minutes per side or until fork tender. Let them cool slightly, then slice into wedges. Shallow fry at medium heat in a little olive oil. Season to taste. 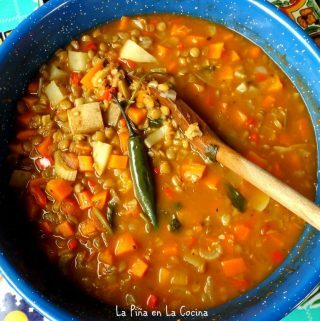 Combine all ingredients in a food processor and process on high for 30 to 40 seconds. Use right away, or store in plastic freezer bags in your freezer. Great for any recipe that requires breading. 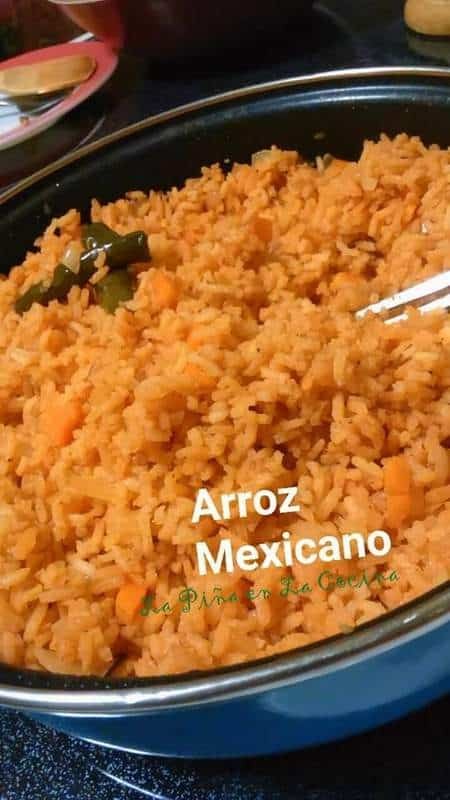 Click onto picture to see full recipe for Arroz Mexican-Mexican Red Rice. Had to quadruple the recipe being Family Dinner Night. No leftovers …need I say more. Yes, I will. I did it with chicken and it was very moist, tender and crispy. The second I made them I didn’t have any breadcrumbs or saltines to make crumbs. BUT what I had on hand and took a chance , I used my Pepperidge Farm Dried Stuffing Mix which was flavored with sage and onion. It came out really good. Next time I will try it with the pork. You are so amazing . Thank you for the feedback Mary! 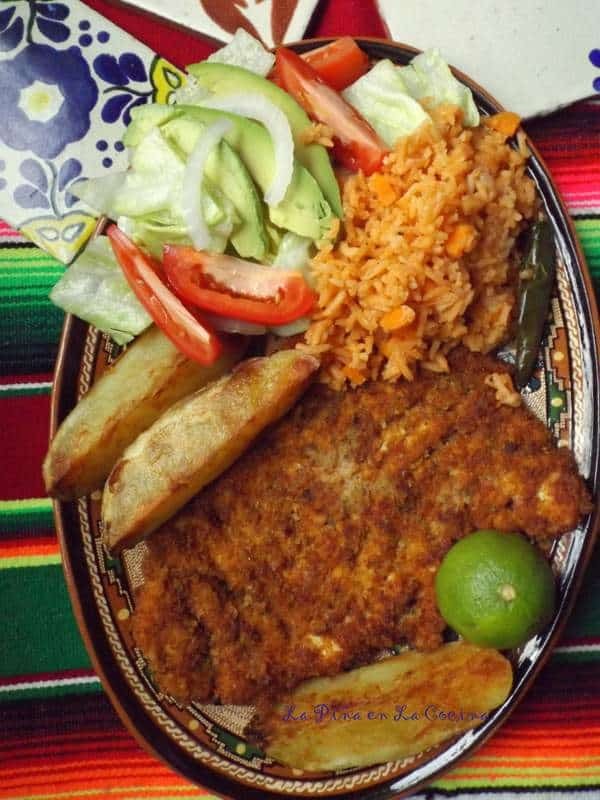 Milanesa is one of our favorite meals. I love the idea of the other bread crumbs! Yum!